When and where will the Wild Game Feast be? 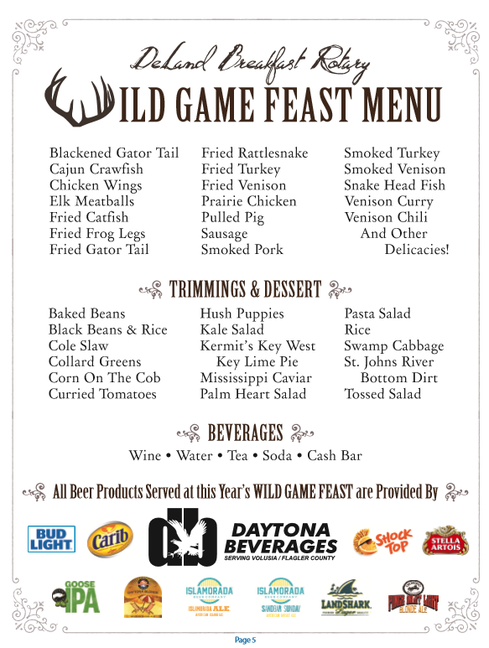 The 28th Annual Wild Game Feast will be Thursday, May 2, 2019, in the Tommy Lawrence Arena at the Volusia County Fairgrounds. The Fairgrounds are at 3150 E. New York Avenue (SR 44) in DeLand. Who can get tickets to the Wild Game Feast? How much are tickets to the Wild Game Feast? All tickets are $60 each. What should I wear to the Wild Game Feast? It's all casual at the Wild Game Feast! May in Florida means shorts probably are in order, but the casual-wear is up to you! Yes. Beer and wine products will be provided by Daytona Beverages (Budweiser products). We'll also be serving wine, coffee, tea, soda and have a cash bar. Something for everyone. Please see a sample menu below!